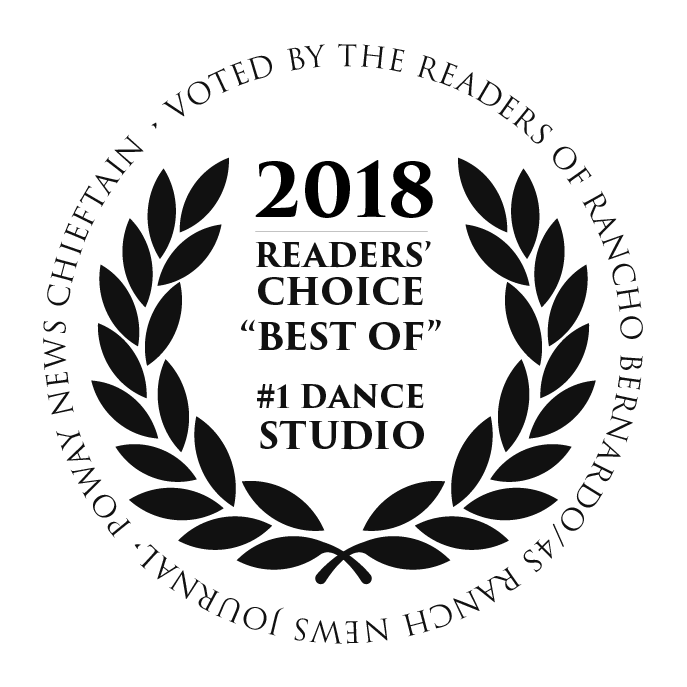 Southern California Ballet voted Best Dance Studio in 2018 Best of North Inland Reader's Poll for the fourth consecutive year. Today we’d like to introduce you to Martha Leebolt. I started dancing at Southern California Ballet (then known as Black Mountain Dance Center) when I was 11 years old under the direction of Sylvia Palmer-Zetler, the founder. After graduating from high school I moved to England and became a professional ballet dancer in Northern Ballet for 15 years. During that time in the UK, I rose to the rank of principal dancer, getting the opportunity to create numerous leading roles in different ballets, and performing around the world. In 2014 and 2015 I came back to guest in the Nutcracker as the Sugar Plum Fairy and the following year my husband, Toby Batley joined me in re-choreographing the variations of Nutcracker Act 2. After discussions with Sylvia and the board of SCB it was decided that we would take over as Artistic Directors in September of 2017… And here we are! Yes, it has been a pretty smooth transition. The biggest challenge is juggling so many different tasks at any one time. When you are dancing there is just the one focus. When you are running a school you are constantly thinking about every individual student, their progression, planning which shows will be performed, running the day to day schedule, budget… the list goes on and on. The challenge is trying to manage all these different aspects without getting overwhelmed. 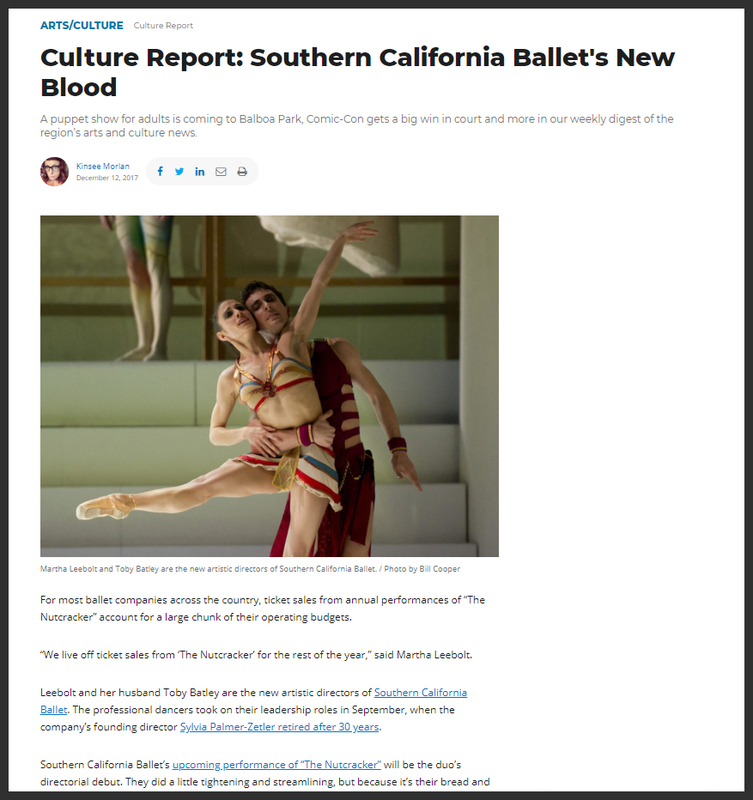 So let’s switch gears a bit and go into the Southern California Ballet story. Tell us more about the business. Southern California Ballet is the premier dance training institute serving San Diego’s Poway and North County areas, and is the only dance academy in the broader region to offer Cecchetti method training and examinations, recognized by “Cecchetti USA” and “Cecchetti International”. It is a centre of excellence in Southern California, involving and enriching the community and bringing the art of ballet to EVERYONE and ANYONE whether as a participant, audience member or both. We hold ourselves to our slogan — “training that lasts a life time” As a 501(3) (c) non-profit organization, Southern California Ballet relies on its community, consisting of dedicated families and volunteers, that keeps dance thriving. Their involvement and commitment are essential to the life of SCB. A past nominee for “Best Nutcracker ” by The Tommy Dance Awards. We were the “No.1 Dance studio in the Pomerado news annual ‘Best of North Inland’ Reader’s choice poll 2015 & 2016” and our Nutcracker was recently reviewed as a favorite of San Diego Arts 2017: Dance and Performance section by Kris Eitland. The importance of exercise in our lives is growing every day. Dance is one of the most effective forms of exercise that a person can do. Dance also encourages artistic expression, improves mental health and promotes physical wellbeing. We hope to change the image of dance from something that people think of as frivolous, to the reality that dance training is serious and teaches people important skills like focus, dedication, physical strength & co-ordination. Dancers are equal parts athletes and artists, one of the only activities that offers both of these qualities. In the future we hope to be able to offer a higher number of classes with a larger facility so that we can share dance with even more people. Most importantly, more performance opportunities so dancers can share and celebrate their hard work with the community and with their families. For most ballet companies across the country, ticket sales from annual performances of “The Nutcracker” account for a large chunk of their operating budgets. “We live off ticket sales from ‘The Nutcracker’ for the rest of the year,” said Martha Leebolt. Leebolt and her husband Toby Batley are the new artistic directors of Southern California Ballet. The professional dancers took on their leadership roles in September, when the company’s founding director Sylvia Palmer-Zetler retired after 30 years. Southern California Ballet’s upcoming performance of “The Nutcracker” will be the duo’s directorial debut. They did a little tightening and streamlining, but because it’s their bread and butter, they didn’t want to fiddle with too much, too fast. Change will come, though. Southern California Ballet will continue as a classical ballet company dedicated to professional performances as well as training kids. But Leebolt and Batley, who’ve performed in ballets internationally, say the company’s shift can be seen in next year’s programming. In the spring, they’re bringing back “Coppélia,” a fun, lighthearted piece that the company hasn’t performed in 15 years. Eventually, they’d also like to start writing and producing original ballets. The duo said they’ll also be doing a bigger marketing push next year, working to turn something that’s long been perceived as the company’s biggest weakness – the fact that they’re headquartered in a far-flung venue in Carmel Mountain Ranch – into its biggest strength. They said people assume they have to see “The Nutcracker” and other ballets at the Civic Theatre or some other fancy downtown venue in order to see world-class performers, and that good shows couldn’t possibly be happening in the suburbs. njoy a magical ballet experience with the Southern California Ballet’s 26th annual production of Tchaikovsky’s “The Nutcracker,” at 1 p.m. and 7 p.m. Saturday, Dec. 16 and 1 p.m. Sunday, Dec. 17 at the Poway Center for the Performing Arts, 15498 Espola Road. 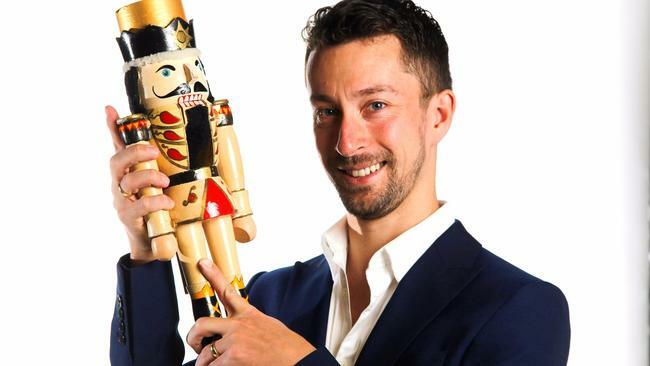 This will be the first production of “The Nutcracker” since SCB founder and artistic director Sylvia Palmer-Zetler retired earlier this year. She was succeeded by former SCB student and Rancho Bernardo High School graduate Martha Leebolt, as well as Leebolt’s dancing partner and husband, Toby Batley. Leebolt said she and Batley have not made any significant changes to the production this year. The duo re-choreographed and restructured parts of the second act last year while directing, which Leebolt said they will retain for this year’s show. The show has also had some tweaks, she said, to tighten up scenes and make sure the audience is kept on track to follow a certain character through the show. “We made sure it was streamlined,” she said. The show will continue its tradition of bringing in guest artists to perform the roles of the Sugar Plum Fairy and her Cavalier. Leebolt guested as the Sugar Plum Fairy twice, in 2014 and 2015. This year, Laura Somers Moreton, a dancer with the Atlanta Ballet, will perform the role. David Ward, formerly of the Northern Ballet and Balletmet Columbus, will dance as her Cavalier. San Diego native Isaiah Bindel, formerly with the San Francisco Ballet and DanceDawsonSF, will perform as the Snow Cavalier. Even with “The Nutcracker” preparing for performance, Leebolt said there won’t be much of a break, as the SCB will be preparing for its spring performance, “Coppelia,” followed by exams for students. Tickets for the show range from $25 to $43 for adults, with discounts for children 18 and under, students with I.D., seniors, military and groups available. Tickets are available at the box office, by calling 858-748-0505 or online at powaycenter.com. 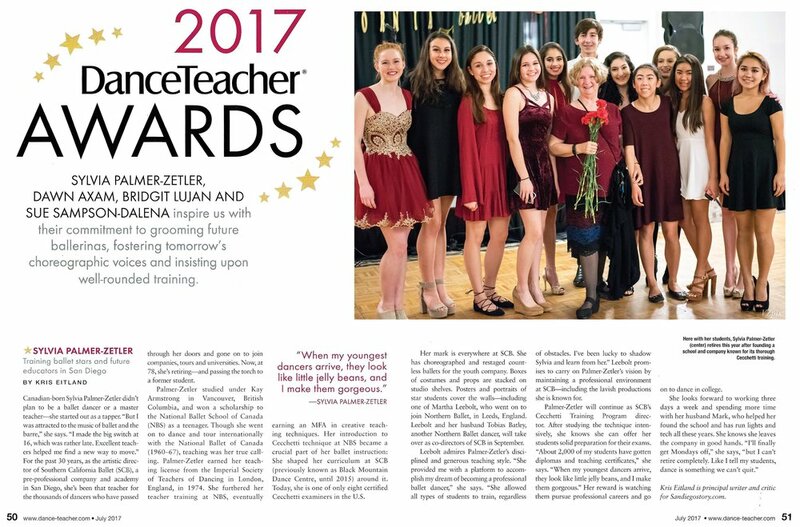 Southern California Ballet founder Sylvia Palmer-Zetler was recently honored by the national Dance Teacher magazine for her work teaching ballet. She was one of four dance instructors nationwide to receive a 2017 Dance Teacher Award. Her fellow award-winners were Dawn Axam of Atlanta, Georgia; Bridgit Lujan of Central New Mexico Community College in New Mexico; and Sue Sampson-Dalena of Fresno. The award honors four outstanding educators for their contributions to the field of dance, according to the magazine’s website. The winners are selected from nominations sent in by students, colleagues and other members of the dance community. Palmer-Zetler said she was in “really good company” with her fellow winners. When she was originally contacted by the magazine about the award, she thought it might be a scam, she said, as she had been contacted by numerous fake award scams after earning her master’s degree. When she found out it was real, she said she was honored and everyone involved was very nice and helped her out at the Dance Teacher Summit, where she was presented with her award. Palmer-Zetler founded the Southern California Ballet, then called the Black Mountain Dance Centre, 30 years ago, following a career as a dancer in the National Ballet of Canada and teaching at the National Ballet School of Canada. She retired as the ballet’s artistic director in February, but has remained on as the director of the Southern California Ballet’s Cecchetti program, which is a progressive system of training dancers from a pre-ballet beginning level to a professional level. Dancers must pass exams to move on to a higher level of instruction, which Palmer-Zetler will administer. She is one of eight certified Cecchetti examiners in the United States. The new co-directors of the ballet are Martha Leebolt and her husband Tobias Batley, who recently retired from the Northern Ballet in Leeds, England. Leebolt is a former student of Palmer-Zetler. The duo look over on Sept. 1. Canadian-born Sylvia Palmer-Zetler didn't plan to be a ballet dancer or a master teacher—she started out as a tapper. "But I was attracted to the music of ballet and the barre," she says. "I made the big switch at 16, which was rather late. Excellent teachers helped me find a new way to move." For the past 30 years, as the artistic director of Southern California Ballet (SCB), a pre-professional company and academy in San Diego, she's been that teacher for the thousands of dancers who have passed through her doors and gone on to join companies, tours and universities. Now, at 78, she's retiring—and passing the torch to a former student. Palmer-Zetler studied under Kay Armstrong in Vancouver, British Columbia, and won a scholarship to the National Ballet School of Canada (NBS) as a teenager. Though she went on to dance and tour internationally with the National Ballet of Canada (1960–67), teaching was her true calling. Palmer-Zetler earned her teaching license from the Imperial Society of Teachers of Dancing in London, England, in 1974. She furthered her teacher training at NBS, eventually earning an MFA in creative teaching techniques. Her introduction to Cecchetti technique at NBS became a crucial part of her ballet instruction: She shaped her curriculum at SCB (previously known as Black Mountain Dance Centre, until 2015) around it. Today, she is one of only eight certified Cecchetti examiners in the U.S. Her mark is everywhere at SCB. She has choreographed and restaged countless ballets for the youth company. Boxes of costumes and props are stacked on studio shelves. Posters and portraits of star students cover the walls—including one of Martha Leebolt, who went on to join Northern Ballet, in Leeds, England. Leebolt and her husband Tobias Batley, another Northern Ballet dancer, will take over as co-directors of SCB in September. Leebolt admires Palmer-Zetler's disciplined and generous teaching style. "She provided me with a platform to accomplish my dream of becoming a professional ballet dancer," she says. "She allowed all types of students to train, regardless of obstacles. I've been lucky to shadow Sylvia and learn from her." Leebolt promises to carry on Palmer-Zetler's vision by maintaining a professional environment at SCB—including the lavish productions she is known for. Palmer-Zetler will continue as SCB's Cecchetti Training Program director. After studying the technique intensively, she knows she can offer her students solid preparation for their exams. "About 2,000 of my students have gotten diplomas and teaching certificates," she says. "When my youngest dancers arrive, they look like little jelly beans, and I make them gorgeous." Her reward is watching them pursue professional careers and go on to dance in college. She looks forward to working three days a week and spending more time with her husband Mark, who helped her found the school and has run lights and tech all these years. She knows she leaves the company in good hands. "I'll finally get Mondays off," she says, "but I can't retire completely. Like I tell my students, dance is something we can't quit." 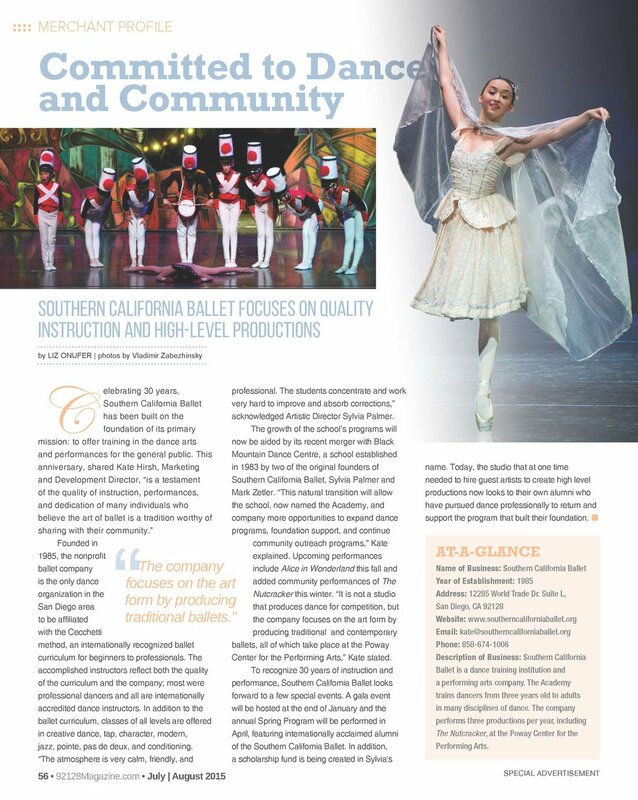 Southern California Ballet is focused on education, enrichment, and opportunities for growth, from the academy – which offers daily classes for ages three and up – to the company – which is by invitation and involves 15 hours of rehearsal each week and three annual productions. “As a nonprofit, our focus includes enhancing the community we serve,” explained Executive Director Kate Hirsh. This holds true for aspiring dancers and delighted audiences alike. Classes are open to all ages, and Kate shared, “One of our most appreciated and best-kept secrets is our adult ballet and tap classes. We have daytime ballet on Wednesday and Friday at 10 a.m. and evening classes for ballet and tap.” The studio is also proud of its growing boys’ program, with free and reduced tuition opening opportunities for male students to discover the art of dance. SCB’s mission of community enrichment continues with The Nutcracker performances especially for local schoolchildren and seniors. Visit the SCB website to learn more and reserve tickets. The Southern California Ballet (SCB) celebrates 30 years of training local dancers and providing community outreach. SCB’s primary mission is to offer training in the dance arts and provide ballet performances for the general public. “SCB is a testament to the quality of instruction, performances, and dedication of many individuals who believe the art of ballet is a tradition worthy of sharing with their community,” said Kate Hirsh, Marketing and Development Director. Founded in 1985, the nonprofit ballet company is the only dance organization in the San Diego area to be affiliated with the Cecchetti method, an internationally recognized ballet curriculum for beginners to professionals. The Academy’s accomplished instructors reflect the quality of the Cecchetti curriculum. All of the faculty are internationally accredited dance instructors and many have danced professionally. In addition to the ballet curriculum, the Academy also offers all levels of creative dance, tap, character, modern, jazz, pointe, pas de deux, and conditioning classes. “The atmosphere is very friendly and professional. The students concentrate and work hard to improve their skills and absorb corrections,” said Artistic Director Sylvia Palmer. The growth of the school’s programs will now be aided by its recent merger with Black Mountain Dance Centre, a school established in 1983 by two of the original founders of Southern California Ballet, Sylvia Palmer and Mark Zetler. “This natural transition will allow the school, now named the Academy, and company more opportunities to expand dance programs, extend foundation support, and continue community outreach programs,” said Hirsh. Upcoming performances include Alice in Wonderland in early September and the holiday tradition, The Nutcracker, which will be performed in December. “It is not a studio that produces dance for competition. The company focuses on the art form by producing traditional and contemporary ballets, all of which take place at the Poway Center for the Performing Arts,” Hirsh added. To recognize 30 years of instruction and performance, Southern California Ballet looks forward to a few special events. A gala will be hosted at the end of January and the annual Spring Program will be performed in April, featuring internationally acclaimed alumni of the Southern California Ballet. In addition, a scholarship fund is being created in the name of the founding artistic director, Sylvia Palmer. Today, the studio that at one time needed to hire guest artists to create high-level productions now looks to its own alumni who have pursued dance professionally to return and support the program that built their foundation.